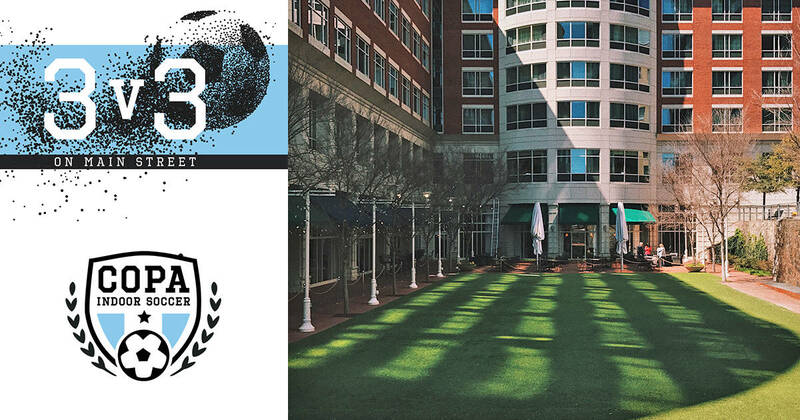 “3v3 on Main St.” is a free soccer event for all ages being held at The Village Green at the Courtyard Marriott Greenville Downtown and is hosted by COPA Indoor Soccer on May 6, from Noon to 3:00 p.m. DJ Nate C “The Chief” will also be on site for the event. The event will feature three mini soccer arenas (kids, junior and adult). Teams can pre-register or sign up on site, it is free to play. There will be free giveaways, such as free membership, free open play, and many more from COPA Indoor Soccer and also free giveaways like speakers and more tech giveaways from Wynit. Southern Pressed Juicery and King of Pops will be slinging ice cold juice and pops and Nantucket will have the Margaritas flowing. The American Outlaws Greenville, official fanbase for US Soccer in Greenville, is a sponsor and will be on site. It should be a great attraction!